Background: One of the consequences of toxoplasmosis is the risk of passing it from mother to fetus and the onset of congenital toxoplasmosis during pregnancy. The purpose of this study was to evaluate the B1 gene of Toxoplasma gondii in the placental tissues of pregnant women with acute toxoplasmosis. Materials and Methods: The study was a cross-sectional study. Serum samples of pregnant women who attended to Fatemieh Hospital of Hamadan University of Medical Sciences were tested for immunoglobulin G (IgG) antibodies against T. gondii by enzyme-linked immunosorbent assay. Then, polymerase chain reaction was used to identify the specific B1 gene of T. gondii in IgG seropositive women. The placental tissues of the pregnant women with positive serum B1 gene examined for this gene. Anti-Toxoplasma immunoglobulin M (IgM) was performed on the umbilical cord and neonate blood. Results: Anti-Toxoplasma IgG was detected in 167 out of 653 (25.6%) pregnant women. T. gondii B1 gene was identified in 36 out of 167 (21.6%) of IgG seropositive women. After delivery, the B1 gene was evaluated in 15 out of 36 (41.7%) patients' placental tissues, 13 of which were positive for this gene (86.7%). Anti-Toxoplasma IgM was detected neither in any umbilical cord nor in neonatal blood samples. All newborns, with the exception of one case, were born with normal birth weight and in term birth. Conclusion: The B1 gene was detected in 86.7% of the placental tissue of women who were involved in acute toxoplasmosis during pregnancy. Toxoplasmosis is an infection that caused by the widespread parasitic protozoan Toxoplasma gondii. According to estimates, about one-third of the world's population is infected with T. gondii. Most people get toxoplasmosis by eating meat containing tissue cysts or using water and food contaminated with parasite oocysts. One of the most important forms of infection is congenital toxoplasmosis that can be predicted if a pregnant woman is infected with this protozoan during pregnancy. The parasite can cause a wide range of clinical symptoms in congenitally infected fetuses, newborns, and children. Toxoplasmosis seroprevalence in females of childbearing age and pregnant in different continents is about 0.8%–77.5%. According to estimates, the overall prevalence of toxoplasmosis in Iranian pregnant women is 41% (95% confidence interval = 36%–45%). The annual incidence of congenital toxoplasmosis is estimated to be around 190,000 and an enormous disease burden of 1.2 million disability-adjusted life years (DALYs) per year. When a pregnant woman is infected with T. gondii, the placenta is the source of the parasite transmission from mother to fetus during pregnancy, the parasite is entered into the tissue immediately or within a few weeks. In women who are infected with T. gondii during pregnancy and not treated, the incidence of fetal infection is 25% in the first trimester, 54% in the second trimester, and 65% in the third trimester. If acute toxoplasmosis is detected quickly, drug administration such as spiramycin reduces the transmission of infection from mother to fetus. Treatment of pregnant women infected with toxoplasmosis reduces the concentration of parasites in the placental tissue and decrease the risk of transmission of infection from mother to fetus. The seroprevalence rate of T. gondii in Iranian people is 39.3%, and there was no statistically significant difference between male and female patients. The prevalence rate of chronic and acute toxoplasmosis in the Hamadan pregnant women was reported 30% and 2.9%, respectively. If the infection with T. gondii is detected in the placenta, it should be accepted that the child is more likely to become infected. B1 gene has a high specificity in T. gondii and has been repeated 35 times in its genome, so it is used as a target for amplification in polymerase chain reaction (PCR) to detect parasites in clinical materials such as the blood and tissue. In other parts of the world, limited research has been done on the role of placenta in the occurrence of congenital toxoplasmosis, but the purpose of this study was to evaluate the status of the concentration of T. gondii in placental tissue by identifying the B1 gene in pregnant women with acute toxoplasmosis. This cross-sectional study was conducted from July 2016 to May 2017 in Hamadan University of Medical Sciences (UMSHA), Iran. The population of this study was pregnant women referred to Fatemieh Hospital of Hamadan. Each of the pregnant women participating in the study signed the formal consent form and the research methodology was approved by the Ethical Committee of the UMSHA. After recording the demographic information and clinical symptoms, blood sample of each pregnant woman was tested for anti-Toxoplasma immunoglobulin G (IgG) and immunoglobulin M (IgM) antibodies by ELISA. In IgGseropositive pregnant women, B1 gene of T. gondii in blood samples was detected by nested PCR and specific primers. This group of pregnant women was searched for T. gondii B1 gene in their placental tissue samples after delivery. Fifty grams of the placental tissue was taken from the maternal side of each placenta with a pair of sterile scissors and a pair of forceps. Samples of the placenta were put in 15 ml tubes and filled with 5 ml of saline and transferred to the laboratory in a cool box and stored at −20°C for DNA extraction. Besides, after delivery, up to 5 ml of umbilical cord blood was obtained to study anti-Toxoplasma IgM. Also during 2–6 weeks after birth, about 2 ml of blood from the heel of 11 newborns were prepared for specific IgM identification. The DNAs were extracted from the placental tissue samples using a commercial purification system (CinnaPure DNA, Iran) according to the manufacturer's instruction. Before starting the DNA extraction, about 30 g of each of the placental tissue samples were crushed. Then, they converted into powder by the liquid nitrogen and the mortar. Then, the remaining steps were done in accordance with the kit protocol. Fifty milliliter of preheated elution buffer was added to each column and repeated centrifugation. At the end, the purified DNA concentration and purity by NanoDrop were checked and stored at −80°C. To identify the B1 gene that has 35 copies in the genome of T. gondii, PCR and nested PCR were used according to Burg et al. First, a pair of external primers, B1-external-forward-5'-TCAAGCAGCGTATTGTCGAG-3' (at position 663-682) and B1-external-reverse-5'-CCGCAGCGACTTCTATCTCT-3' (at position 949-930) were used to amplify 287 bp of B1 gene, then two internal primers, B1-internal-forward-5'-GGAACTGCATCCGTTCATGAG-3' (at position 694-714) and B1-internal-Reverse-5'-TCTTTAAAGCGTTCGTGG TC-3' (at position 887-868) were used to amplify 194 bp fragment. For PCR, a combination of 12.5 μl of Master Mix buffer (2X, Ampliqon, Denmark), 0.8 μl (mM) of each primer, 8.9 μl of distilled water, and 2 μL of template DNA was used. To carry out nested-PCR, 1 μL of the PCR product as a template diluted in distilled water at a ratio of 1:50, and was performed according to the previous step. For positive and negative control of the reactions, the RH strain of T. gondii (accession No: AF179871.1) and the DNA-free reaction was used, respectively. Amplification steps were performed according to the following pattern: 5 min at 95°C for initiation of denaturation, 35 cycles for 25 s at 95°C, annealing at 62°C for 40 s at both PCR and nested PCR, in 72°C for 40 s extension and 5 min at 72°C for final extension. An amount of 6 μL of each sample of the nested-PCR product was electrophoresed in the gel and then observed under ultraviolet light. The statistical distribution of the B1 gene in the placental tissue in gestational age, trimesters, and age groups was analyzed using the Chi-square test and Fisher's exact test. P < 0.05 indicated a statistical significant difference between variables. Anti-Toxoplasma IgG was detected in 167 out of 653 (25.6%) pregnant women. The stages of research are shown in the flowchart [Figure 1]. Anti-Toxoplasma IgG negative women were excluded from the study. The age range of the individuals was between 20 and 47 years old and the mean age was 31.8 ± 5.4 years. Two out of 167 IgG-positive women were found to be positive for specific IgM antibodies. Using PCR and nested PCR, 36 out of 167 (21.6%) IgG seropositive individuals were positive for the T. gondii B1 gene. In [Figure 2], the bands in the nested-PCR gene are found at 194 bp. In either of the two IgG and IgM serum-positive cases, the B1 gene was not detected. After delivery, 15 out of 36 (41.7%) placental tissues of pregnant women who were positive for the B1 gene were obtained. 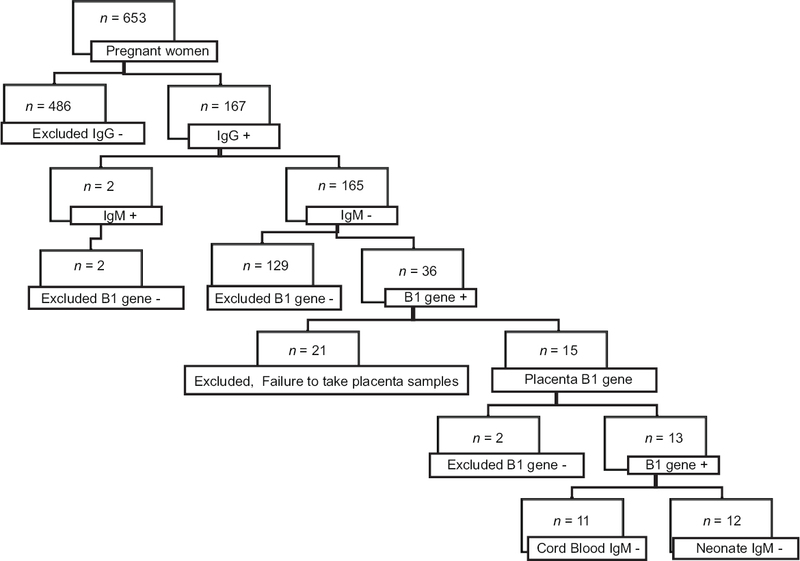 Thirteen out of 15 (86.7%) placental tissues were positive for the B1 gene in nested PCR. The most common clinical signs in people with the B1 gene in their placental tissue were muscle pain (61.5%) and nausea (53.8%). In 11 infants of women whose B1 gene was detected in their placental tissue, anti-Toxoplasma IgM was tested, but it was negative. In addition, anti-Toxoplasma IgM was not found in any of the 12 umbilical cord blood samples of these women. Two pregnant women who have been diagnosed with B1 gene in their placental tissues have experienced abortions in the past pregnancies. In order to see the changes in the IgG antibody titers, serum samples of four individuals who were positive for IgG antibodies in the first stage were rechecked after 2 weeks. Evaluation of titration of anti-Toxoplasma IgG in the pregnant women blood samples showed an increase in three and decrease in one. Using Fisher's exact test, there was no significant relationship between the frequency of the B1 gene in placental tissue and age group (P > 0.05). In this study, B1 gene was detected in serum samples of 36 pregnant women. After delivery, B1 gene was identified in 13 of 15 (86.7%) of the placental tissue of women with acute toxoplasmosis. Following the study of seroconversion in pregnant women and confirming the occurrence of acute toxoplasmosis, placental tissue testing is important. Some studies have shown that early diagnosis of acute toxoplasmosis during pregnancy and therapeutic interventions helps reduce congenital infections., Due to the role of the placenta in the transmission of T. gondii, this organ is considered as a therapeutic and diagnostic target. In order to identify T. gondii B1 gene in the placenta, inoculation and PCR techniques are used. In some studies, the sensitivity of the method of mouse inoculation was lower in comparison with PCR., The results of some studies to detect T. gondii DNA in the placenta by PCR have been reported as 6.2%, 25%, 60.9%, and 79.5%. In our study, the detection of T. gondii DNA in placenta samples was relatively high because all patients were untreated and the parasite DNA during pregnancy detected in their blood samples. Studies have shown that treating pregnant women with acute toxoplasmosis reduce the concentration of parasite in the placenta and decrease the sensitivity of detection of T. gondii DNA in this organ., In a study, eight pregnant women with acute toxoplasmosis were treated with spiramycin. After delivery, T. gondii DNA was detected in the five placentas (62.5%), however, the parasite was detected in the placenta samples of the two untreated patients (100%). Identification of anti-Toxoplasma IgM in cord blood or newborns is an appropriate marker of congenital toxoplasmosis. However, during delivery, the infant's blood may be infected with maternal blood, so other samples need to be tested. In the present study, anti-Toxoplasma IgM was not detected in the umbilical cord blood samples. Probably, one of the reasons for not detecting anti-Toxoplasma IgM is related to its gradual reduction during pregnancy. In one study, 87 blood samples of pregnant women were positive about anti-Toxoplasma IgG and only two case of cord blood (0.8%) was positive for anti-Toxoplasma IgM. In another study, in 0.39% of the cord blood samples, this antibody was detected. Due to the fact that one of the evidence of the occurrence of congenital toxoplasmosis is the detection of anti-Toxoplasma IgM in neonates, in this study, IgM and clinical symptoms of congenital toxoplasmosis in newborns were not identified. In some studies, anti-Toxoplasma specific IgM was not observed in infants with congenital toxoplasmosis., Negative results of IgM in the diagnosis of neonates born from mothers with acute toxoplasmosis can be related to perform an antibody test at a time near the onset of infection in which case the IgM has been either not yet produced or is not detectable. According to the WHO criteria, preterm birth is gestational age <37 weeks and low birth weight is the birth weight ≤2499 g. In this study, a case of low birth weight was seen, but no premature birth was observed. Some studies have not reported a significant relationship between low birth weight and prematurity with anti-T. gondii maternal serum profiles. In our study, women blood samples were taken in the 2nd to 7th months of gestation. Therefore, it is not expected that after delivery, the anti-Toxoplasma IgM cannot be detected in the umbilical cord blood and blood of the newborns. Since anti-Toxoplasma IgM rapidly increases during the first week of infection, then it decreases and disappear at very variable rates. In this study, the most common nonspecific symptoms of pregnant women were muscle pain in 8 (61.5%) and nausea in 7 (53.8%) patients. Based on literature, acute toxoplasmosis in 90% of pregnant women is asymptomatic. In a survey, 52% of women who gave birth to children with congenital toxoplasmosis did not mention anything about exposure to risk factors and symptoms of infection during pregna ncy. In the present study, changes in the anti-Toxoplasma IgG titer were observed in a few pregnant women. However, in their placental tissue, B1 gene was identified. Perhaps, these women have been infected with acute toxoplasmosis during pregnancy at different times, so the antibody titers were increasing or decreasing. An increase in the anti-Toxoplasma IgG titer in a few weeks in the absence of anti-Toxoplasma IgM does not indicate acute infection. In two pregnant women with acute infection who had a history of abortion, their previous abortions were probably not related to T. gondii. In a study, in women with a history of abortion, anti-Toxoplasma IgG (43%) and IgM (4%) were observed. There were limitations of this study, including the impossibility of providing placenta samples of all pregnant women with acute infection. A number of women under study were born outside the scope of research. Some women gave birth suddenly and at an indefinite time. For different reasons, it was not possible to take blood samples from all newborns and umbilical cords. The B1 gene was detected in 86.7% of placental tissue of women who were involved in acute toxoplasmosis during pregnancy. The project was supported by Hamadan University of Medical Sciences (no 9504081777). Tenter AM, Heckeroth AR, Weiss LM. Toxoplasma gondii: From animals to humans. Int J Parasitol 2000;30:1217-58. Montoya JG, Liesenfeld O. Toxoplasmosis. Lancet 2004;363:1965-76. Pomares C, Montoya JG. Laboratory diagnosis of congenital toxoplasmosis. J Clin Microbiol 2016;54:2448-54. Pappas G, Roussos N, Falagas ME. Toxoplasmosis snapshots: Global status of Toxoplasma gondii seroprevalence and implications for pregnancy and congenital toxoplasmosis. Int J Parasitol 2009;39:1385-94. Foroutan-Rad M, Khademvatan S, Majidiani H, Aryamand S, Rahim F, Malehi AS, et al. Seroprevalence of Toxoplasma gondii in the Iranian pregnant women: A systematic review and meta-analysis. Acta Trop 2016;158:160-9. Torgerson PR, Mastroiacovo P. The global burden of congenital toxoplasmosis: A systematic review. Bull World Health Organ 2013;91:501-8. Thulliez P. Maternal and foetal infection. In: David HM, Joynson TG, editors. Toxoplasmosis: A Comprehensive Clinical Guide. Cambridge: Cambridge University Press; 2001. p. 197-206. McAuley JB. Congenital toxoplasmosis. J Pediatric Infect Dis Soc 2014;3 Suppl 1:S30-5. Fricker-Hidalgo H, Brenier-Pinchart MP, Schaal JP, Equy V, Bost-Bru C, Pelloux H, et al. Value of Toxoplasma gondii detection in one hundred thirty-three placentas for the diagnosis of congenital toxoplasmosis. Pediatr Infect Dis J 2007;26:845-6. Daryani A, Sarvi S, Aarabi M, Mizani A, Ahmadpour E, Shokri A, et al. Seroprevalence of Toxoplasma gondii in the Iranian general population: A systematic review and meta-analysis. Acta Trop 2014;137:185-94. Maghsood A, Fallah M, Moradi-Sardareh H, Shanazi H, Hosseini-Zijoud SM, Moradi Y. Seroepidemiology of toxoplasmosis in pregnant women referring to health centers in the city of Hamadan in 1391. Pajouhan Sci J 2013;11:3-8. Robert-Gangneux F, Murat JB, Fricker-Hidalgo H, Brenier-Pinchart MP, Gangneux JP, Pelloux H, et al. The placenta: A main role in congenital toxoplasmosis? Trends Parasitol 2011;27:530-6. Burg JL, Grover CM, Pouletty P, Boothroyd JC. Direct and sensitive detection of a pathogenic protozoan, Toxoplasma gondii, by polymerase chain reaction. J Clin Microbiol 1989;27:1787-92. Boughattas S, Ben-Abdallah R, Siala E, Souissi O, Aoun K, Bouratbine A, et al. Direct genotypic characterization of Toxoplasma gondii strains associated with congenital toxoplasmosis in Tunisia (North africa). Am J Trop Med Hyg 2010;82:1041-6. Robert-Gangneux F, Dupretz P, Yvenou C, Quinio D, Poulain P, Guiguen C, et al. Clinical relevance of placenta examination for the diagnosis of congenital toxoplasmosis. Pediatr Infect Dis J 2010;29:33-8. Fricker-Hidalgo H, Pelloux H, Racinet C, Grefenstette I, Bost-Bru C, Goullier-Fleuret A, et al. 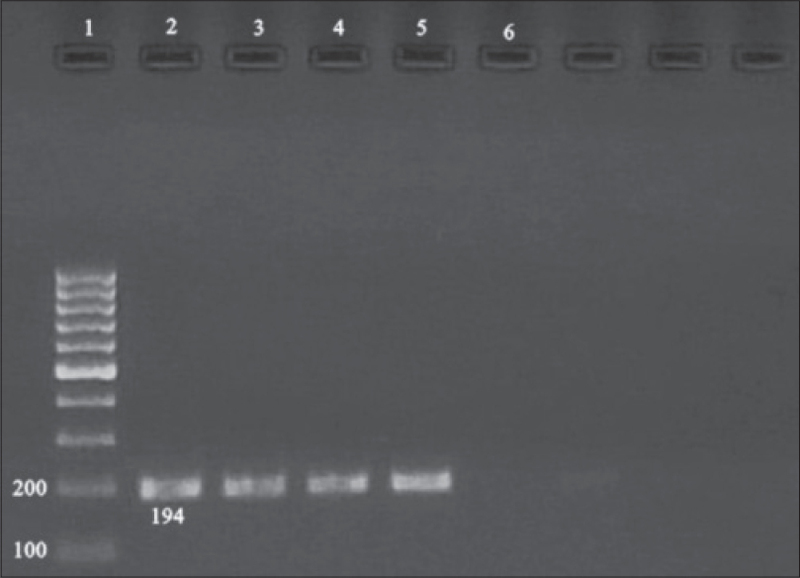 Detection of Toxoplasma gondii in 94 placentae from infected women by polymerase chain reaction, in vivo, and in vitro cultures. Placenta 1998;19:545-9. Filisetti D, Cocquerelle V, Pfaff A, Villard O, Candolfi E. Placental testing for Toxoplasma gondii is not useful to diagnose congenital toxoplasmosis. Pediatr Infect Dis J 2010;29:665-7. Sterkers Y, Pratlong F, Albaba S, Loubersac J, Picot MC, Pretet V, et al. Novel interpretation of molecular diagnosis of congenital toxoplasmosis according to gestational age at the time of maternal infection. J Clin Microbiol 2012;50:3944-51. Pinon JM, Dumon H, Chemla C, Franck J, Petersen E, Lebech M, et al. Strategy for diagnosis of congenital toxoplasmosis: Evaluation of methods comparing mothers and newborns and standard methods for postnatal detection of immunoglobulin G, M, and A antibodies. J Clin Microbiol 2001;39:2267-71. Gras L, Gilbert RE, Wallon M, Peyron F, Cortina-Borja M. Duration of the IgM response in women acquiring Toxoplasma gondii during pregnancy: Implications for clinical practice and cross-sectional incidence studies. Epidemiol Infect 2004;132:541-8. Shieh M, Didehdar M, Hajihossein R, Ahmadi F, Eslamirad Z. Toxoplasmosis: Seroprevalence in pregnant women, and serological and molecular screening in neonatal umbilical cord blood. Acta Trop 2017;174:38-44. Gómez-Marin JE, de-la-Torre A, Angel-Muller E, Rubio J, Arenas J, Osorio E, et al. First Colombian multicentric newborn screening for congenital toxoplasmosis. PLoS Negl Trop Dis 2011;5:e1195. Moncada PA, Montoya JG. Toxoplasmosis in the fetus and newborn: An update on prevalence, diagnosis and treatment. Expert Rev Anti Infect Ther 2012;10:815-28. McLeod R. Utility and limitations of T. Gondii-specific igM serum antibodies in the diagnosis of congenital toxoplasmosis in Porto Alegre. J Pediatr (Rio J) 2014;90:329-31.
WHO: Recommended definitions, terminology and format for statistical tables related to the perinatal period and use of a new certificate for cause of perinatal deaths. Modifications recommended by FIGO as amended october 14, 1976. Acta Obstet Gynecol Scand 1977;56:247-53. Fochi MM, Baring S, Spegiorin LC, Vaz-Oliani DC, Galão EA, Oliani AH, et al. Prematurity and low birth weight did not correlate with anti-Toxoplasma gondii maternal serum profiles – A Brazilian report. PLoS One 2015;10:e0132719. Kravetz JD, Federman DG. Toxoplasmosis in pregnancy. Am J Med 2005;118:212-6. Boyer KM, Holfels E, Roizen N, Swisher C, Mack D, Remington J, et al. Risk factors for Toxoplasma gondii infection in mothers of infants with congenital toxoplasmosis: Implications for prenatal management and screening. Am J Obstet Gynecol 2005;192:564-71. Villard O, Cimon B, L'Ollivier C, Fricker-Hidalgo H, Godineau N, Houze S, et al. Serological diagnosis of Toxoplasma gondii infection: Recommendations from the French national reference center for toxoplasmosis. Diagn Microbiol Infect Dis 2016;84:22-33. Matin S, Shahbazi G, Namin ST, Moradpour R, Feizi F, Piri-Dogahe H, et al. Comparison of placenta PCR and maternal serology of aborted women for detection of Toxoplasma gondii in Ardabil, Iran. Korean J Parasitol 2017;55:607-11.